Indian-fig prickly pear Opuntia ficus-indica in fruit, photographed by Luigi Rignanese. A couple of months ago, I engaged in something of an experiment. One of the houses alongside the park where we exercise The Great Beast That is Called Dragon has a prickly pear tree overhanging its fence and, having a vague understanding that they are supposed to be edible, I picked a ripe fruit as I walked past. Very carefully, of course, in order to avoid touching the spines (not entirely successfully, unfortunately). When I got home I cut it open and tried it. The verdict: not unpleasant, not dissimilar to pawpaw but without the somewhat vomity overtones that I've found pawpaw tends to have. The fruit wasn't hugely sweet, contrary to what I've heard, but that can probably be explained by the tree I'd picked it off not being a variety directly selected for eating. Christopher also tried some and suggested that they might work well as a base for muffins, so a few days later I went down to the park with a bag and filled it with fruit. The resulting muffins (made using a generic fruit muffin recipe from good old Alison Holst) were, again, not unpleasant but fairly bland: the overall taste in this case resembled cornbread. More problematic were the numerous seeds, which the baking process turned into unbreakable pieces of buckshot with an unfortunate tendency to stick in the crown of one's teeth. So, not an unsuccesful experiment overall, but not something that gave me a surefire winner for the next pot luck. 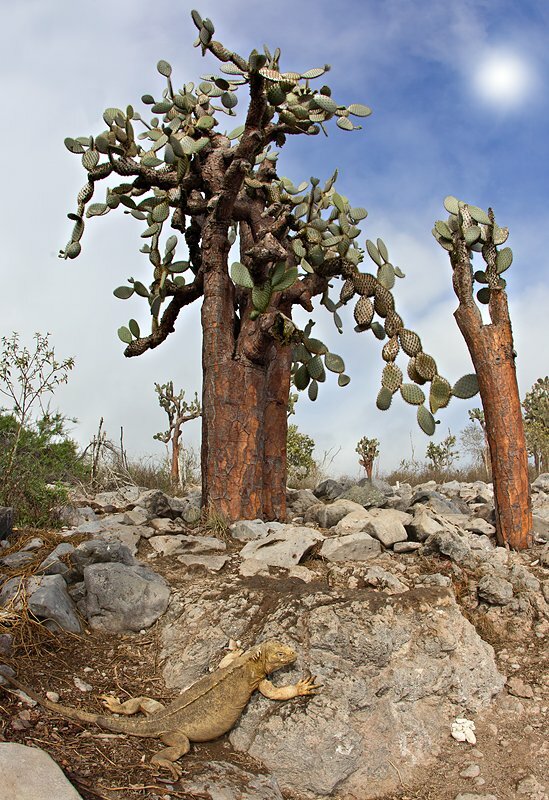 Arborescent prickly pears Opuntia megasperma from Santa Fe in the Galapagos Islands, photographed by Arthur Morris. So what are prickly pears, anyway? Prickly pears and their close relatives form a clade within the cacti known as the Opuntioideae, distinguished by the possession of small, fine, easily detached spines known as glochids (Griffith & Porter 2009). It was these that had parts of my hand itching like mad after picking my first fruit despite my best efforts to avoid being spiked (for the second batch, I had the sense to take a pair of garden gloves). Despite this armament, prickly pears are deliberately grown in some areas for their fruit, with the glochids being removed by processes such as washing the fruit in sand. The broad flat pads of the stem may also be peeled and used as a vegetable, and they have been used in the southwest United States as feed for livestock during droughts with the spines being burnt off beforehand by the application of a propane torch, referred to as a 'pear burner' (Russell & Felker 1987). Prickly pears are also the host of the commercially significant cochineal insect Dactylopius coccus, discussed in a previous post. 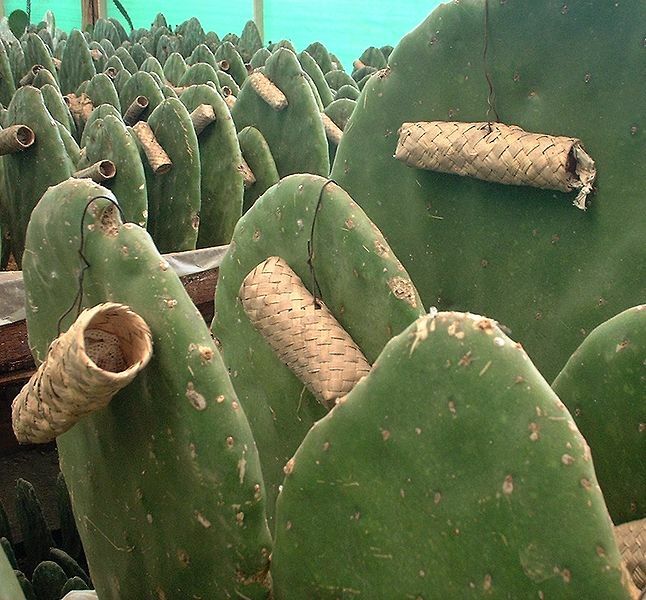 Prickly pear pads with woven nests hung on them for the collection of cochineal bugs, photographed by Oscar Carrizosa. Generic divisions within the Opuntioideae have been shuffled around over the years, with some authors placing the majority of species in a broad Opuntia. Alternatively, Opuntia may be restricted to species with broad flattened stem segments (cladodes), with cylindrical-stemmed species separated into genera such as Cylindropuntia (the chollas). A molecular analysis of relationships within the Opuntioideae by Griffith & Porter (2009) supported the monophyly of the flat-stemmed opuntioids, though Opuntia in the strictest sense could not be resolved as monophyletic relative to two segregate genera, Nopalea and Consolea, each distinguished by derived flower morphologies*. 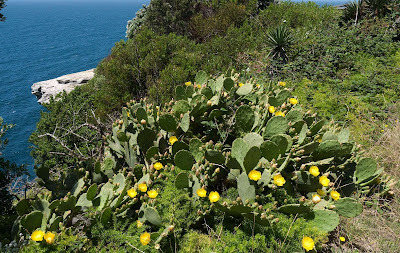 Even in the strict sense, Opuntia is a genus of a couple of hundred species, though issues such as morphological plasticity and rampant hybridisation make the exact number of species debatable. *Leading to the statement, "if strict monophyletic generic classification is desired, Consolea and Nopalea may be sunk into a slightly wider Opuntia" (Griffith & Porter 2009). Once again, as with the Anolis vs Norops situation I referred to last week, we have the recognition of a 'genus' determined not by questions of their own established monophyly, but by their relationship to another less clearly established 'genus'. The invasive Opuntia stricta growing on cliffs at Watsons Bay in Sydney, Australia, photographed by Tony Rodd. Of course, when it comes to biological control, context is everything. 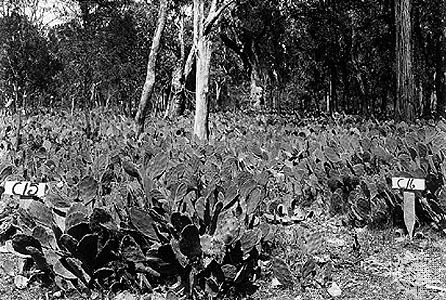 Though hailed as a saviour in Australia, the spread of Cactoblastis in the southern United States has been the subject of some concern, as it threatens endangered native Opuntia species. Griffith, M. P., & J. M. Porter. 2009. Phylogeny of Opuntioideae (Cactaceae). International Journal of Plant Sciences 170 (1): 107-116. Russell, C. E., & P. Felker. 1987. 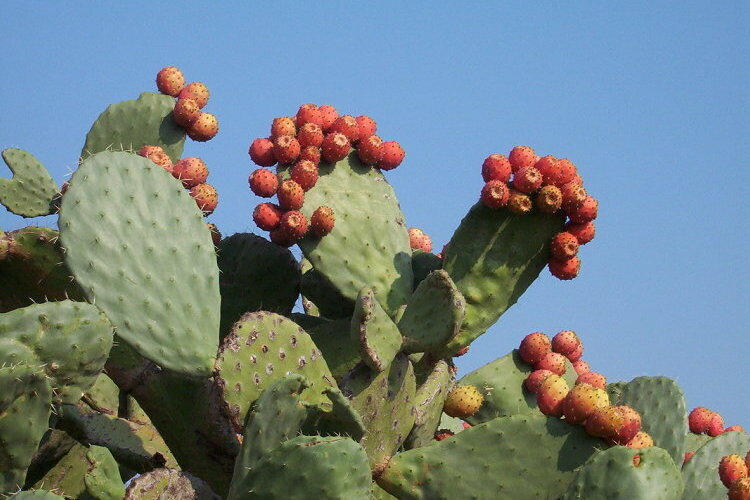 The prickly-pears (Opuntia spp., Cactaceae): a source of human and animal food in semiarid regions. 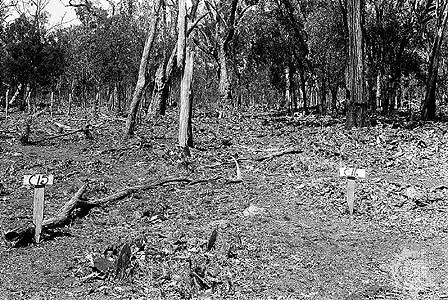 Economic Botany 41 (3): 433-445. I agree regarding the fruit's taste. I picked one while on a roadtrip a few years ago, and also had spines in my hand for a while. I tried one of the pads earlier this year, which are called nopales like the genus Nopalea. Sliced it up for some scrambled eggs, but wasn't a fan due to its slightly sour taste and oozing juice. You ought to take the time to make it into preserves. Wow. Its delicious. My mother in law is from Ukraine and couldn't believe that we'd eat cactus, so I directed her on how to make a pulpy jelly from it. Halve cleaned, ripe prickly pears and scoop out the flesh with a spoon. Add the fruit flesh to water and the juice of a lemon in a liquidiser. This is the easiest way to get the seeds out of the fruit and is a delightful drink on a hot day. The easiest way to get the glochids out of your flesh is to gently place a sticking plaster over them and remove, repeat until all gone. My favourite piece of trivia regarding opuntias is that the spines were once the major export of the island of St Helena. When less organic needles were invented for use with the gramophone the island had to search for other products, at one time manufacturing string for the British Post Office. In Spanish speaking places the sweeter red prickly pear fruit is called tuna. And like Mickey I am accustomed to calling the more savory green pads, which are also consumed, nopales or nopal. In Andalucia they are called chumbera and the fruit chumbos. Best, easiest way to pick the fruit: out of the bin at the supermarket. It's not unusual find them- and sometimes nopales- in Phoenix-area supermarkets. Both are super-common in Mexican supermarkets.